The fact that Italian immigration is constantly on the increase in New York makes it expedient to consider both the condition and status of these future citizens of the republic. The higher walks of American life, in art, science, commerce, literature, and society, have, as is well known, long included many talented and charming Italians; but an article under the above title must necessarily deal with the subject in its lower and more recent aspect. During the year 1879 seven thou­sand two hundred Italian immigrants were landed at this port, one-third of which num­ber remained in the city, and there are now over twenty thousand Italians scattered among the population of New York. 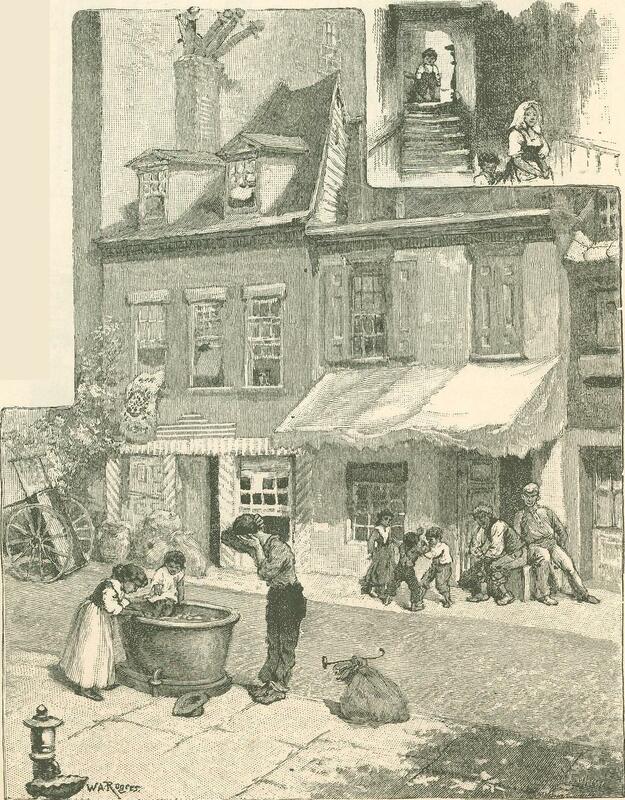 The more recently arrived herd together in colonies, such as those in Baxter and Mott streets, in Eleventh Street, in Yorkville, and in Hoboken. Many of the most important industries of the city are in the hands of Italians as employers and em­ployed, such as the manufacture of macaroni, of objects of art, confectionery, arti­ficial flowers; and Italian workmen may be found everywhere mingled with those of other nationalities. It is no uncom­mon thing to see at noon some swarthy Italian, engaged on a building in process of erection, resting and dining from his tin kettle, while his brown-skinned wife sits by his side, brave in her gold ear­rings and beads, with a red flower in her hair, all of which at home were kept for feast days. But here in America increased wages make every day a feast day in the matter of food and raiment; and why, indeed, should not the archi­tectural principle of beauty supplement­ing necessity be applied even to the daily round of hod-carrying? Teresa from the Ligurian mountains is certainly a more picturesque object than Bridget from Cork, and quite as worthy of incorpora­tion in our new civilization. She is a better wife and mother, and under equal circumstances far outstrips the latter in that improvement of her condition evoked by the activity of the New World. Her children attend the public schools, and develop very early an amount of energy and initiative which, added to the quick intuition of Italian blood, makes them valuable factors in the population. That the Italians are an idle and thriftless people is a superstition which time will remove from the American mind. A little kind­ly guidance and teaching can mold them into almost any form. But capital is the first necessity of the individual. Is it to be wondered at, therefore, that the poor untried souls that wander from their vil­lage or mountain homes, with no advice but that of the parish priest, no knowl­edge of the country to which they are go­ing but the vague though dazzling remem­brance that somebody's uncle or brother once went to Buenos Ayres and returned with a fortune, no pecuniary resource but that which results from the sale of their little farms or the wife's heritage of gold beads, and no intellectual capital but the primitive methods of farming handed down by their ancestors, should drift into listless and hopeless poverty? Their em­igration is frequently in the hands of shrewd compatriots, who manage to land them on our shores in a robbed and plun­dered condition. On the other hand, the thrifty bour­geois who brings with him the knowledge of a trade, and some little capital to aid him in getting a footing, very soon be­gins to prosper, and lay by money with which to return and dazzle the eyes of his poorer neighbors, demoralizing his native town by filling its inhabitants with yearn­ings toward the El Dorado of "Nuova York." Such a man, confectioner, hair­dresser, or grocer, purchases a villa, sets up his carriage, and to all appearance pur­poses spending his life in elegant leisure; but the greed of money-getting which he has brought back from the New World surges restlessly within him, and he breaks up his establishment, and returns to New York to live behind his shop in some damp, unwholesome den, that he may add a few more dollars to his store, and too often his avarice is rewarded by the con­traction of a disease which presently gives his hard-earned American dollars into the hands of his relatives in Italy. There is an element of chance in the success of Italians which makes emigration with them a matter of more risk than with oth­er nationalities of more prudence and foresight. The idyllic life of an Italian hill-side or of a dreaming mediaeval town is but poor preparation for the hand-to-hand struggle for bread of an overcrowd­ed city. Hence the papers of the penin­sula teem with protests and warnings from the pens of intelligent Italians in America against the thoughtless abandon­ment of home and country on the uncer­tain prospect of success across the ocean. The fruit trade is in the hands of Ital­ians in all its branches, from the Broad­way shop with its inclined plane of glow­ing color, to the stand at a street corner. Among the last the well-to-do fruit-mer­chant has a substantial wooden booth, which he locks up in dull times, removing his stock. In winter he also roasts chest­nuts and pea-nuts, and in summer dis­penses slices of water-melon and aqua cedrata to the gamins of the New York thoroughfares, just as he once did to the small lazzaroni of Naples or the fisher-boys of Venice. 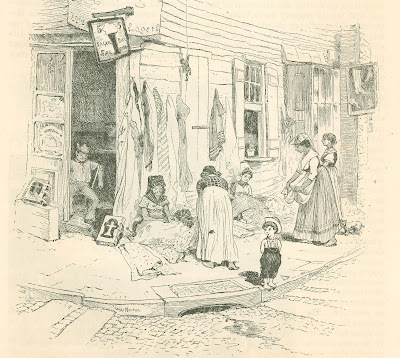 With the poorer mem­bers of the guild the little table which holds the stock in trade is the family hearth-stone, about which the children play all day, the women gossip over their lace pillows, and the men lounge in the lazy, happy ways of the peninsula. At night the flaring lamps make the dusky faces and the masses of fruit glow in a way that adds much to the picturesque­ness of our streets. These fruit-merchants are from all parts of Italy, and always converse cheerfully with anyone who can speak their language, with the excep­tion of an occasional sulky youth who de­clines to tell where he came from, there­by inviting the suspicion that he has fled to escape the conscription. That they suffer much during our long cold winters is not to be doubted, but the patience of their characters and the deprivations to which they have always been accustomed make them philosophic and stolid. As soon as they begin to prosper, the fatalism of poverty gives place to the elastic inde­pendence of success, and their faces soon lose their characteristic mournfulness. I have seen young Italian peasants walking about the city, evidently just landed, and clad in their Sunday best - Giovanni in his broad hat, dark blue jacket, and leg­gings, and Lisa with her massive braids and gay shawl, open-eyed and wide-mouthed in the face of the wonderful civ­ilization they are to belong to in the fu­ture. The elevated railroad especially seems to offer them much food for speculation - a kind of type of the headlong recklessness of Nuova York, so unlike the sleepy old ways of the market-town which has hitherto bounded their vision. There are two Italian newspapers in New York - L'Eco d' Italia and Il Repub­licano. There are also three societies for mutual assistance - the "Fratellanza Ita­liana," the "Ticinese," and the "Bersag­lieri." When a member of the Fratel­lanza dies, his wife receives a hundred dollars; when a wife dies, the husband receives fifty dollars; and a physician is provided for sick members of the society. It gives a ball every winter and a picnic in summer, which are made the occasion of patriotic demonstrations that serve to keep alive the love of Italy in the hearts of her expatriated children. Many of the heroes of '48 are to be found leading quiet, humble lives in New York. Many a one who was with Garibaldi and the Thou­sand in Sicily, or entered freed Venice with Victor Emanuel, now earns bread for wife and child in modest by-ways of life here in the great city. Now and then one of the king's soldiers, after serv­ing all through the wars, drops down in his shop or work-room, and is buried by his former comrades, awaiting their turn to rejoin King Galantuomo. There is something pathetically noble in this quiet heroism of work-day life aft­er the glory and action of the past. I met the other day in a flower factory, stamping patterns for artificial flowers, an old Carbonaro who had left his coun­try twenty-two years before- one of the old conspirators against the Austrians who followed in the footsteps of Silvio Pellico and the Ruffinis. He was gray haired and gray-bearded, but his eyes flashed with the fire of youth when we talked of Italy, and grew humid and bright when he told me of his constant longing for his country, and his feeling that he should never see it again. It was a suggestive picture, this fine old Italian head, framed by the scarlet and yellow of the flowers about him, while the sunlight and the brilliant American air streamed over it from the open window, and two young Italians, dark-eyed and stalwart, paused in their work and came near to listen. It was the Italy of Eu­rope twenty years back brought face to face with the Italy of America to-day. In another room, pretty, low-browed Ital­ian girls were at work making leaves - girls from Genoa, Pavia, and other cities of the north, who replied shyly when ad­dressed in their native tongue. Italians are especially fitted for this department of industry; indeed, their quick instinct for beauty shows itself in every form of delicate handiwork. In the second generation many Italians easily pass for Americans, and prefer to do so, since a most unjust and unwarranted prejudice against Italians exists in many quarters, and interferes with their success in their trades and callings. It is much to be regretted that the sins of a few tur­bulent and quarrelsome Neapolitans and Calabrians should be visited upon the heads of their quiet, gentle, and hard­working compatriots. All Italians are proud and high-spirited, but yield easily to kindness, and are only defiant and re­vengeful when illtreated. There are two Italian Protestant churches in the city, various Sunday-schools, mission and industrial schools, into which the Italian element enters largely, established and carried on by Protestant Americans, chiefly under the auspices of the Children's Aid Society. The most noteworthy of these, as being attended exclusively by Italians, adults and children, is the one in Leonard Street. Some four hundred boys and girls are under instruction in the afternoon and night schools, most of them being engaged in home or industrial occupations during the day. The building is large and airy, containing schoolrooms, bathrooms, a reading-room, and printing-offices, where work is furnished to Italians at the usu­al wages, and those seeking instruction are taught. There is a class of twenty-four girls who are taught plain sewing and ornamental needle-work, including lace-making. I visited this class, and found a number of little girls employed with lace cushions, and the manufac­ture of simple artificial flowers. With these last they were allowed to trim the new straw hats that had just been given them. They were plump, cleanly little creatures, much better off in the matter of food and raiment than their contempo­raries of the peninsula. The lace class has been in existence but a short time, and the specimens are still somewhat coarse and irregular, but there is no reason why it should not become as important a branch of industry among the Italian women of America as among those of Europe. The only wonder is that in­struction in a calling which exists by in­heritance in Italy should be needed here, as these girls are mostly from the villages of Liguria, of which Genoa is the sea-port, and might fairly be supposed to know something of the craft which has made Rapallo and Santa Margherita famous. Shirts for outside orders are also made in the school, and the girls receive the same wages for their labor as are offered by the shops. The attendants upon the school are mostly Ligurians, and repudiate indignantly all kinship with the Neapolitans or Calabrians, whom they refuse to rec­ognize as Italians, thereby showing how little the sectional sentiment of Italy has been affected by the union of its parts un­der one ruler. Under the guidance of a lady connect­ed with the school, I explored Baxter and contiguous streets, nominally in search of dilatory pupils. Here and there a small girl would be discovered sitting on the curb-stone or in a doorway, playing jack-stones, with her hair in tight crimps, pre­paratory to participation in some church ceremony. An Italian feminine creature of whatever age, or in whatever clime, stakes her hopes of heaven on the dressing of her hair. Her excuse for remaining away from school was that she had to "mind the stand," or tend the baby, while her mother was occupied elsewhere, and her countenance fell when she was re­minded that she could have brought the baby to school. 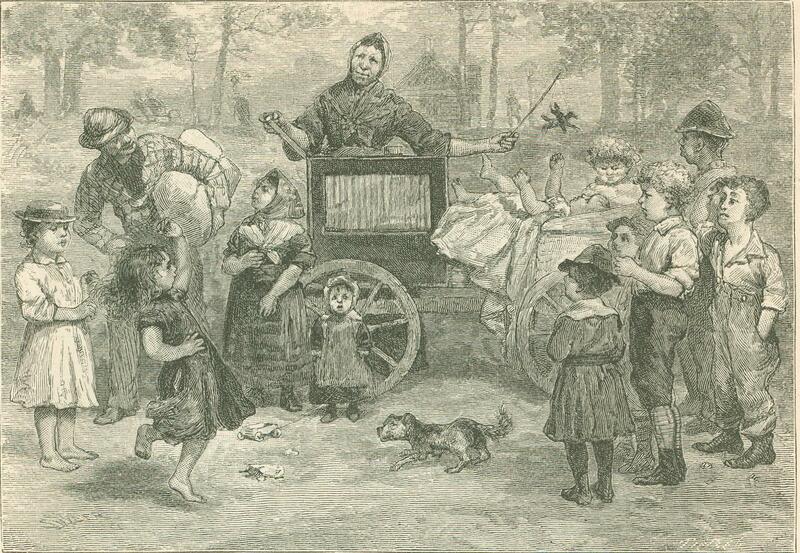 It was noticeable that all these children, who had left Italy early or were born here, had clear red and white complexions, the result of the American climate. We passed through courts and alleys where swarthy Neapolitans were carting bales of rags and up dark stairs where women and children were sorting them. Some of their homes were low, dark rooms, neglected and squalid; others were clean and picturesque, with bright patchwork counterpanes on the beds, rows of gay plates on shelves against the walls, mantels and shelves fringed with colored paper, red and blue prints of the saints against the white plaster, and a big nose­gay of lilacs on the dresser among the earthen pots. Dogs and children were tumbling together on the thresholds just as they do in the cool corridors of Italian towns. On the first floor of one of the houses I found an establishment for the repairing of hand-organs, where a youth was hammering at the barrel of one, and a swarthy black bearded man, to whom it belonged, was lounging on a bench nearby. Against the smoke-blackened wall an armful of lilacs stood in a corner, filling the room with sweetness, and leading naturally to the thought that with the spring and the flowers the organ-grinder prepares for a trip into the country, playing his way from one watering-place to another, accompanied perhaps by his fam­ily, or at least a child or two. 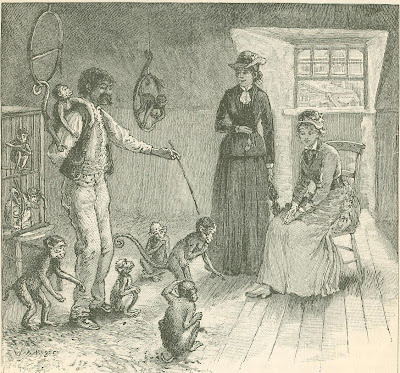 In answer to an inquiry concerning monkeys, we were directed to a large double house op­posite, said to be inhabited entirely by Neapolitans, who were swarming about the windows in all their brown shapeli­ness. In the hallway above the rickety outer stairs lounged several men with red shirts and unkempt heads and faces. One of them was the proprietor of the monkey establishment, and his farouche manner disappeared with our first words of interest in his pets. He led us into the little room adjoining, where some six or eight half-grown monkeys were peering through the bars of their cages, evidently pleading to be let out. The most credit­ably schooled monkey was released first, handed his cap, made to doff and don it, and shake hands, orders being issued both in Italian and English. Some of the others - small brown things with bright eyes, and "not yet quite trained," said the Neapolitan - were allowed a moment's respite from captivity, at which they screamed with joy, and made for the dish of soaked bread, dipping their paws into it with great greediness, while the padrone laughed indulgently. A properly trained organ-monkey is worth from twenty to thirty dollars. In the great house known to Baxter Street as the "Bee-hive," we found the handsome padrona whose husband rents organs and sells clocks, which latter ar­ticles appear to be essentials to Italian housekeeping, in default of the many bells of the old country. The padrona was at first by no means eager to give informa­tion, as she supposed, in good broad Amer­ican (she was born in New York), that it "would be put in the papers, like it was before." It would appear that the advan­tages of communication with the outer world are not appreciated by the inhabit­ants of Baxter Street. The padrona final­ly informed me that the rent of an organ was four dollars a month, and that they had hard work getting it out of the people who hired them, "for they always told you they had been sick, or times were bad, or their children had been sick; and when the Italians came over they ex­pected you to give them a room with a carpet and a clock, else they said you had no kindness." I saw in the cluster of eight houses that form the "Bee-hive" va­rious humble homes, from the neat and graceful poverty adorned with bright col­ors, and sweet with the bunch of lilacs brought from the morning's marketing (the favorite flower of the neighborhood), to the dens of one room, in which three or four families live, and take boarders and lodgers into the bargain. They told me that the building contained a thou­sand souls, and that cases of malarial fe­ver were frequent. It is true that the odors of Baxter Street are unhealthy and unpleasant, arguing defective drainage; but those of Venice are equally so, and exist for the prince no less than the beg­gar. As for overcrowding, no one who, for example, has spent a summer in Genoa, and has seen the stream of pallid, languid humanity pour out of the tall old houses of the Carignano district, can find food for sensationalism in the manner of life common to Baxter Street. It must be remembered that the standard of pros­perity in America is not that of Italy, and that a man is not necessarily destitute nor a pauper because he prefers organ-grinding or rag-picking to shoemaking or hod-car­rying, and likes macaroni cooked in oil better than bakers' bread and tough meat. I fail to find that Italians here retain their national habits of enjoyment or their love of feast-day finery. 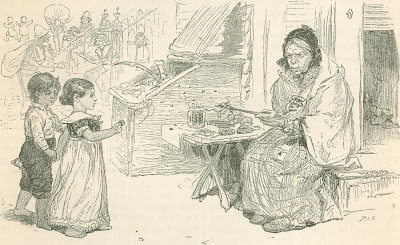 True, I have seen contadine in gold beads and ear-rings sitting on their door-steps on Sunday afternoons, and I have watched a large family making merry over a hand­ful of boiled corn, just as they did at home, and I have seen the Genoese ma­trons dress one another's hair of a Sun­day morning in the old fashion. But the indifferentism and stolidity of the coun­try react upon them. There seems to be little of the open-air cooking, the polenta and fish stalls, the soup and macaroni booths that breed conviviality in the Ital­ian streets. They apparently eat in their own homes, after the New World fashion. Undoubtedly much of the recklessness with which Italians are charged in New York is the result of the sudden removal of religious influences from their lives. At home there is a church always open and at hand and the bells constantly re­mind them of the near resting-place for soul and body. 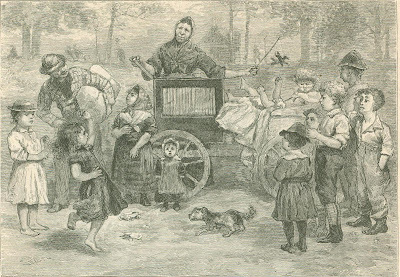 When their homes are noisy and uncomfortable, they can find peace and quiet in the cool dark churches; and when they are on the verge of quar­rel or crime, and the hand involuntarily seeks the knife, the twilight angelus or the evening bell for the dead softens the angry heart and silences the quick tongue. Here the only escape from the crowded rooms is in the equally crowded yard, or the door-step, or the rum-shop. The only entirely Italian Catholic church in New York, I believe, is that of San Antonio di Padova, in Sullivan Street, attended by a superior class of Italians, all apparently prosperous and at peace with their sur­roundings. In the days of political persecution and struggle in Italy, America was the repub­lican ideal and Utopia toward which the longing eyes of all agitators and revolu­tionists turned. When self-banished or exiled by government, they were apt to seek their fortunes in America, often con­cealing their identity and possible rank, and taking their places among the work­ers of the republic. Among these was Garibaldi, who passed some time here in the suburbs of New York, earning his living like many another honest toiler, and awaiting the right moment to strike the death-blow at tyranny. To study the Italian character in its finer nuances, the analyst should not limit his investiga­tions to the broad generalizations of the Italian quarters, but should prosecute his researches in out-of-the-way down-town thoroughfares, where isolated shops with Italian names over their doors stimulate curiosity. In these dingy places, among dusty crimping-pins, pomatum-pots, and ghastly heads of human hair, half-worn clothing, the refuse of pawnbrokers' shops, you may meet characters that would not have been unworthy the attention of Bal­zac, and would eagerly have been num­bered by Champfleury among his "Excen­triques." I have one in my mind whose short round person, tall dilapidated hat, profuse jewelry, red face, keen gray eyes, and ready tongue fully qualify him for the title of the Figaro of Canal Street. Another interesting class of Italians is found in the people attached to the opera - the chorus-singers and ballet dan­cers, engaged also for spectacular dramas. It is in a measure a migra­tory population, crossing the ocean in the season, and re-crossing when the demand for its labor ceas­es. Many chorus singers who remain in New York follow different trades out of the opera season, and sing sometimes in the theatres when incidental music is required. By singers New York is regarded chief­ly as a market in which they can dispose of their talents to greater pecuniary advan­tage than in Eu­rope, and they en­dure the peculiar contingencies of American life sim­ply in order to lay by capital with which to enjoy life in Italy. A season in America is always looked for­ward to as the means of accumulating a fortune, and not for any artistic value. I have heard of more than one Italian who, after a successful engagement in New York, has invited sundry compa­triots to a supper at Moretti's, and an­nounced his intention of shaking the dust of America from his shoes for evermore, being satisfied to retire on his gains, or to sing only for love of art and the applause of artists in the dingy opera houses of It­aly. The climate of America with its sud­den changes kills the Italian bodies, and the moral atmosphere chills their souls - notably among artists. The "Caffe Mo­retti" has for years been the foyer of op­eratic artists, and no review of Italian life in New York would be complete without a mention of it. For many years they have dined, and supped, and drank their native wines in this dingy, smoke-black­ened place, forgetting for the nonce that they were in America, and, coming away, have left their portraits behind them, large and small, fresh and new, or old and smoke-dried, hanging side by side on the wall to cheer the hearts of the brother artists who should follow after them to the New World, and find a moment's respite from homesickness over Signor Mo­retti's Lachryma Christi and macaroni cooked in the good Milanese fashion. In view of the general assimilation of Ital­ians with their American surroundings, it is surprising and delightful to find a place that retains so picturesque and Italian a flavor. Since the abolishment of the padrone system one sees few child-mu­sicians, and the wandering minstrels are chiefly half-grown boys and young men, who pass their summers playing on steamboats and at watering-places. It is gratifying to feel that one of the dis­graces of modern and enlightened Italy has been wiped from the national rec­ord by the strong hand of governmental authority. Originally published in Harper’s New Monthly Magazine in April of 1881.